Autosmith Clement Dyer wants to create his life-like, mechanical animals in peace. He’s tired of being badgered about selling his business to his long-time rival and former lover, Duke Goodwin. He also craves appreciation for his living works of art. 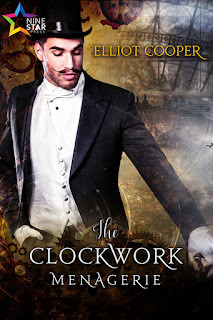 Unfortunately, not all of Clement’s clients see his clockwork creations the way he does, and a prominent but dissatisfied customer threatens to sink his struggling business into the ground. I do love steampunk, so Clement’s mechanical animals attracted me right away. That and the luscious cover, which = niiiice. The romance isn’t wound quite as tightly as the clockwork kitty which opens the story. The poor cat vomiting machine oil is amusing for the reader, less so for the owner, and not at all for Clement, who hasn’t been able to do much new work given the constant repairs. His shop is sinking from such issues: he’s a gifted inventor but not as fine a businessman, and his travails take up a fair amount of the slender word count. His rival, Duke Goodwin, has a yen for the inventor, but shows it badly, forever running into Clement’s prickliness, which is fairly understandable. He’s clumsy at courting, and manages to offend more than appeal. Only a triumphal revelation and some amazing self-examination on Clement’s part let them get past the truly astonishing ways Duke puts his foot in his mouth. The level of relationship goes from a one time lapse in judgement between rivals to quite affectionate. A little more development here would have been welcome.